We’ve had lots of rain and the fields are all blazing in shades of green, the cottonwoods are a deep green and the aspen, too. It’s that time of year when I look around and notice, the baby apples on the trees, the last of the apricots, the tall purple flowers of the echinacea and the golden rod. Even the Chamisa is beginning to bloom out. This morning after the farmers market, I drove up the highway to the James Ranch to pick up my milk, always one of the splendors of my week. As the weeks have passed, the cream on the top of the jug is thicker, the body of the milk is thicker. To me, the milk seems more and more precious because there are now probably only 8 more weeks of it’s divine nourishment, when the girls, as Dan James calls the cows, are put out to pasture. I recall what the poet Donald Hall said about beginning to mourn the loss of light as early as mid-June. The August light seems somehow brighter, stronger, more intense. The Dog Days of summer. But there is an earlier shadow. Remove all the stems and wash the berries than drain. Add 1 cup water to every 4 cups fruit. Place the bunch over very low heat and simmer until the fruit is tender, stirring. Push the pulp through a medium sieve; measure, and add an equal amount of sugar. Place over a medium heat and stir until the sugar has melted. Bring to a full rolling boil (as my mother used to say) and cook until the mixture sheets. Seal in hot sterialized jars. three cups pulp will make about 3 half-pints. We pour it over Coconut Bliss. Next week I will be at the Durango Farmers Market with Growing Roots. If you’re in the area, stop by and see me. 1 Comment on CHOKECHERRY SEASON MEANS BEARS!!!!! I live in town, but at night we hear the bears moving around our dumpsters! I had a dinner party earlier this summer, and at one point all of us ran out (kids included) to see a bear rummaging through the garden. It wasn’t until afterwards that we realized, maybe we should have been running in the opposite direction. 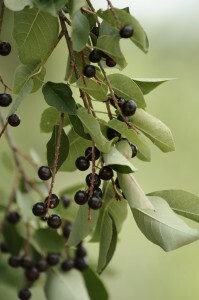 But who wouldn’t run toward chokecherry jam. Yum.